Lead on climate. Empower your staff. Kickstart a movement for clean travel. Climate concern is rising. Appetite for action is growing. Now half of us are ready to reduce flying. Climate Perks employers offer paid ‘journey days’ to empower staff to live their values and choose low-carbon holiday travel. Ready to lead? Climb aboard. The climate crisis is hotting up. We all need to take urgent action. Globally, flying is the fastest growing source of greenhouse gases - yet only 5% of the world’s population have ever flown. With time dwindling to take action, the truth is we don’t have a fossil-fuel-free plane waiting in the wings. This is our problem to solve, and everyone’s problem if we don’t. 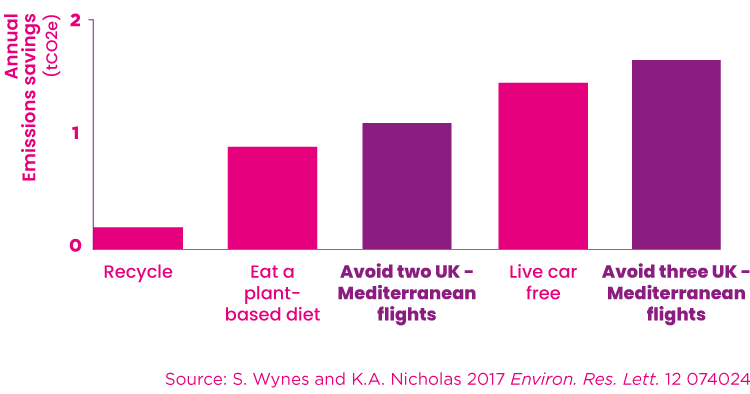 Compared to other planet-friendly behaviour, flying less is one of the most powerful actions we can take to cut carbon. But modern life moves fast. For many, getting away from it all means zipping through the skies. What if we could all find the time to travel lightly? Climate Perks is kickstarting clean travel by land or sea. We found that 50% of people are ready to reduce the amount they fly in response to climate change - but only 3% of us do. There’s a key barrier: time. Climate Perks works with climate-conscious employers to offer paid ‘journey days’ to staff who travel on holiday by train, coach or boat instead of flying - empowering them to act on their values. In exchange, employers receive Climate Perks accreditation in recognition of their climate leadership. Don’t just get ahead of the curve, help bend it in the right direction. Join the Climate Perks pilot for take off in 2019.